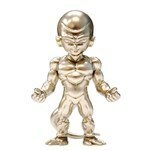 Frieza is the emperor of Universe 7 in the Dragon Ball series. He controls his own imperial army and feared for his ruthlessness and power. This newly designed Golden Frieza expands the Absolute Chogokin Dragonball series.